Nothing beats homemade Beignets! They’re soft, pillowy, fluffy and airy, not to mention totally scrumptious. Close your eyes, take a bite and enjoy! One thing’s for sure, the hot weather will never stop me from cooking or baking in my kitchen. Especially when I have a craving and today’s craving was beignets. I know you can always get in your car and go buy some donuts, but nothing beats a good homemade donut. No matter how hot it is. I have been making donuts for as long as I remember. In fact, this is probably one of the few sweet things my mom used to make, so I loved to be in the kitchen with her when she was making donuts. My job was to sprinkle powdered sugar all over them, the best job, if you ask me! 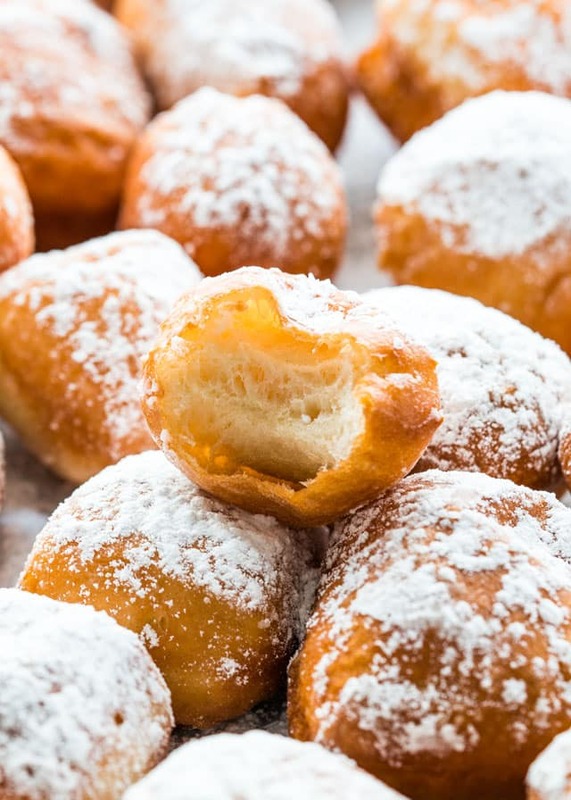 Beignet is a french word and it’s synonymous with the English “fritter” made from deep fried choux pastry. These fried fritters are sometimes also filled with fruit. But today, what we know as a beignet is mostly a square piece of dough, deep fried and dusted with powdered sugar. This is probably what people think of when hearing the word beignet. 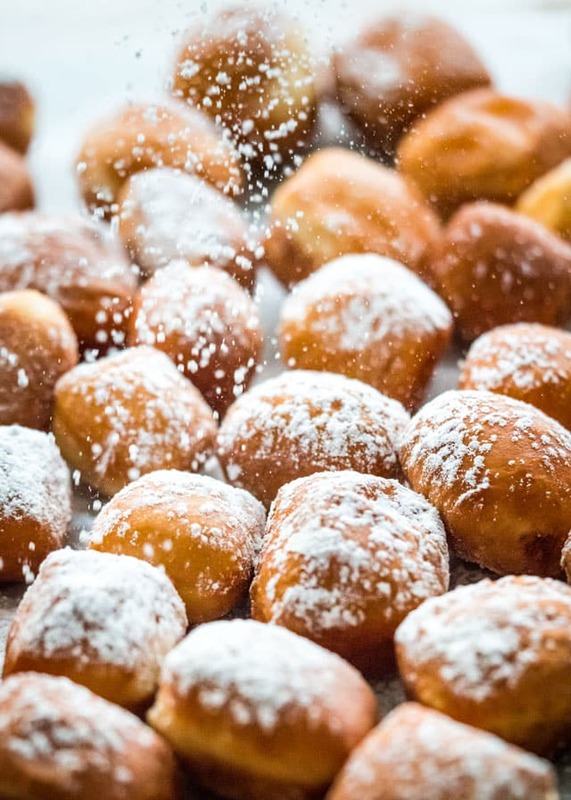 Beignets are also quite popular in New Orleans Creole cuisine, brought there by the French colonists back in the 18th century. The recipe I’m using here is based on Paula Deen’s recipe. I remember I saw this on her show a long time ago so I used her recipe which I modified a bit. However, I used butter instead of shortening and I used milk instead of evaporated milk. I also cut her recipe in half, her original recipe calls for 7 cups of flour and that just seems like a lot of beignets to me. Even the 3 1/2 cups of flour made quite a few beignets. But if you’re planning on feeding a huge crowd go ahead and double the recipe because one thing’s for sure, these will disappear off the table in no time. I love these little beignets because they are not sweet at all and if you want them sweeter just a lot more powdered sugar on them. Before frying these beignets make sure your oil is hot, it needs to be 350 F degrees. Try one at first and check out the oil, the beignet should fry pretty quickly. Fry the beignets, about 5 or 6 at a time. Be careful, they fry quickly, so you have to stand by them and flip them when they’re done on one side. When they’re done, all you have to do is sprinkle them with powdered sugar and enjoy. They are truly delicious, light and fluffy. Nothing beats homemade Beignets! They're soft, pillowy, fluffy and airy, not to mention totally scrumptious. Close your eyes, take a bite and enjoy! In a small bowl combine the water, yeast and sugar. Whisk it all together a bit and let it sit for about 5 to 10 minutes until the yeast dissolves and starts to froth up. Once the yeast has dissolved, add the egg, milk and whisk. To the bowl of your mixer combine the flour and salt. Add the yeast mixture and butter to the bowl. Using the dough hook, mix it well until well incorporated. You will know that the dough is done when it comes clean from the sides of the bowl. Remove the dough from the mixer and place it in an oiled bowl. Cover it with a clean damp towel or plastic wrap and let it sit and double in size, anywhere from 1 to 2 hours, in a warm place. Roll out the dough in a long rectangle that's about 3/4 of an inch in thickness. Cut the dough in long strips then cut the strips to form squares. Add about 3 inches of oil to a deep frying pan, I used a Dutch Oven. Before frying the beignets make sure the oil is hot, it needs to be 350 F degrees. Fry the beignets, about 5 or 6 at a time until golden brown on both sides. Make sure you turn them on both sides to fry them evenly. 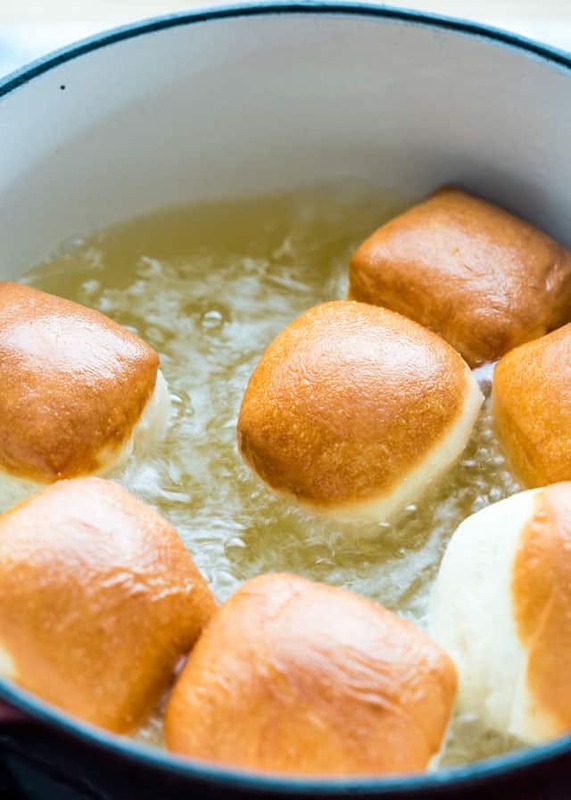 Transfer the beignets to a large bowl lined with paper towels to drain some of the excess oil. 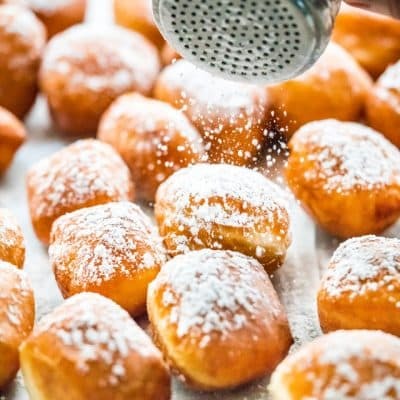 Sprinkle beignets with powdered sugar and serve. If after dissolving the yeast in the lukewarm water with the sugar, the yeast didn't start to froth up, do not continue with the donuts, your dough will not rise. You could also use instant or rapid-rise yeast instead of the active dry yeast. If you do, you do not need to dissolve the yeast in the lukewarm water. It could be mixed right into the dough. Recipe originally shared August 2011. Thanks for the recipe Jo. They were very soft and tasty. My guests absolutely loved them!!! Hey! I’m making these for a dinner party of 6 people – should I double the recipe? 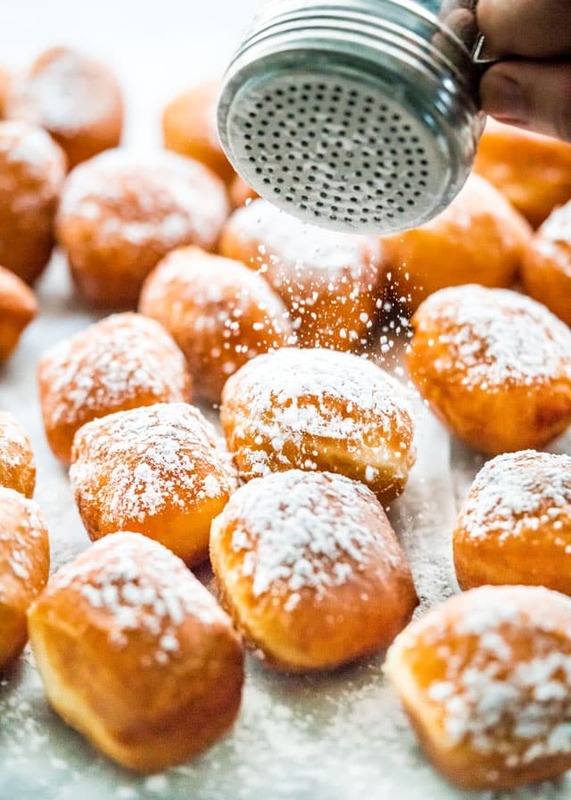 I wasn’t sure how many total beignets this recipe makes – I see the serving number is 12, but I wasn’t sure how many beignets per person you’re factoring in there. 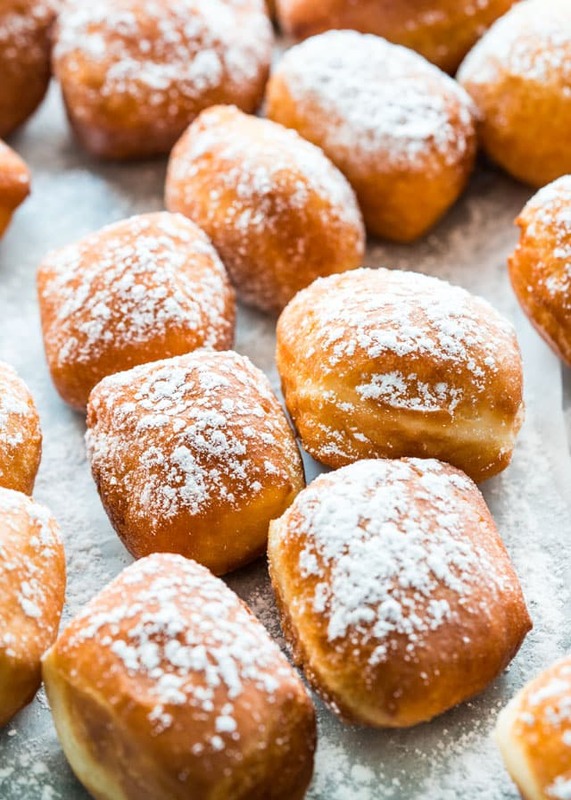 This recipe makes about 35-40, depending on how big you cut the beignets! Super good! To me this is even better than what they sell at Cafe du Monde in New Orleans….. Thanks for sharing the recipe! Can I use evaporated milk instead of ya know… normal milk? I made these on Saturday. 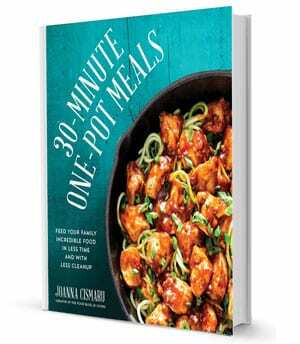 By far the best recipe I have tried. They fried up beautifully, nice and fluffy and airy Thank you! Family loved them. How can u store any leftover dough. It’s definitely better made fresh because of the yeast. You can store extra dough in the freezer to avoid over rising. You can store it in the refrigerator for 4 days. Just remember to punch it down if it gets close to the rim of the bowl. I would not recommend freezing it. I try that once and the rise was not really good. I forgot to transfer the dough into another bowl that grease with oil. Instead I left the dough in the mixing bowl and covered it with a towel for 2 hours. The dough rised almost triple. However, when I fried the dough it is not inflated and spongy like yours. I also left the dough in the freezer . Should I thaw the dough before frying them? What is the reason for this? The oil is hot since the dough was browning pretty quick. Please advise. Thank you. I wouldn’t freeze this dough before cooking it. It definitely works best fresh right after rising. 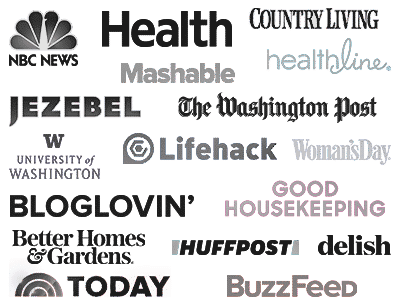 If you follow the instructions how we made them, you will get the same results. Hi, my teenage daughter was craving beignets and I found your recipe thru Google. I used the rapid-rise yeast and add the full packet to the dough as it was mixing in the processor, then let the dough sit out for 2hrs. Turned out great in the end and we had plenty to give away to neighbors. Thanks for awesome recipe! All of the ingredients in your recipe are cut into 1/2 from the original (Paula Deen’s) except the active dry yeast. Is this correct or should we just use half the stated amount? Yes, it’s mentioned in the blog post that I cut her recipe down to 1/2 because the original makes way to many for us. Yes I was just clarifying because the yeast is still the full amount as per the original recipe. So for your recipe I would do 1/2 the envelope, not the full as stated in your recipe? I actually used the whole envelope, because usually for 3 1/2 cups to 4 cups of flour I always use a full envelope. Up to you though. could i make them, cut them and freeze the dough squares, then thaw and fry?